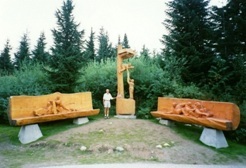 "This collection of 31 wood sculptures was created from some of the most remarkable dead standing trees to be found in the province of British Columbia. Because of the rarity of these giant old growth trees, I have named the collection "Tribute To The Forest". Serving as points of interest along the 30 minute interpretive walk, my towering collection symbolizes the feeling of being within an old growth forest The themes reflect the diversity and importance of our forests to humans as well as nature. I have intentionally focused on the positive roles humans play in our forest ecosystems, since I feel, this is often overlooked. 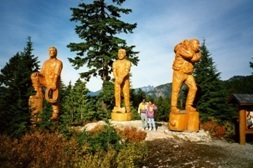 Grouse Mountain's president, Stuart McLaughlin and myself are happy with our unique contribution towards British Columbia's rich forest heritage. We hope people will appreciate the valuable use we have found for these amazing trees which have been preserved through my art. The first log Glenn found for his Grouse Mountain project was a 1200 year old tree that was found lying on the ground for 25 years in the Coquitlum water shed north east of Vancouver. 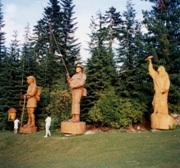 The tree was cut into six pieces and transported to Grouse Mountain. 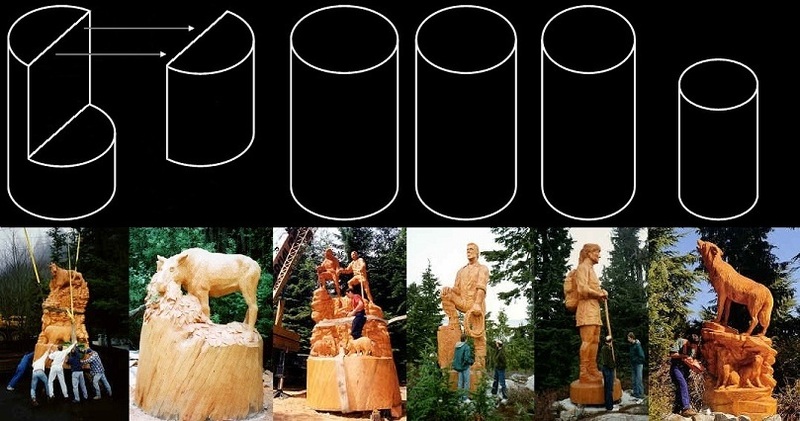 Below is a diagram to show how the tree was cut and the carvings created from each piece. This log was the inspiration for the name "Tribute to the Forest". Through his eight year project, Glenn would find the 30 logs he needed through help of the member companies of the forest alliance of British Columbia. For more pictures of "Tribute to the Forest" and other larger projects, you can order Glenn's 15 minute DVD slide show for $10.00 or his 60 minute DVD documentary for $20.00 - includes shipping. Contact Glenn today to order your copy.